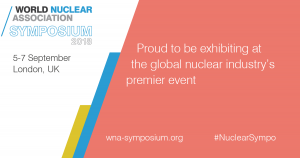 We are proud to announce that Nuclear-21 will be exhibiting at the World Nuclear Association Symposium, to be held 5th – 7th September in London, UK. We will be presenting our NESSAT Toolbox and service offer throughout the 6th September in parallel to the main symposium programme, in Meeting Room 9. Come see us at the event to learn more about us, what we do, and what we can do for you. We look forward to meeting you there!